Two days ago I picked up the farm share. There are only two more weeks left after this one, and things are definitely winding down. There were very few tomatoes left, but lots of kale and escarole. This was also probably the last week for green beans. I came home with a few small eggplants, a few tomatoes, 1 quart cherry tomatoes, 2 quarts green beans, 5 tomatillos, 3 serrano peppers, 4 sweet peppers, 4 squashes, half a pint of raspberries, beets, escarole, kale, chard, lettuce, parsley, cilantro, dill, onions, garlic, leeks and scallions. I have some things set aside to make probably the last batch of caponata, and I'm slowly working through the rest. Today after work I made another half-batch of salsa verde. The vegetables are first roasted for about 8 minutes under the broiler and then puréed with the vinegar, cilantro, lime juice, and cumin. As before, I got 2 half-pint jars and 1 half-cup jar out of that. Other things that have gone on this week: I made lobster mac and cheese, which is terrific drizzled with white truffle oil. Along with that I tried macarons again, getting a little better this time. I used up the leftover honey lemon ganache I'd used on my coffee cake I'd made for the fair. 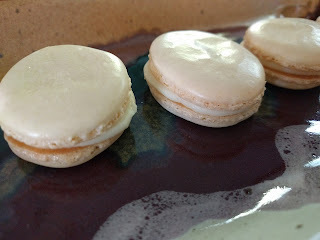 When I ran out of ganache, I filled the macarons with strawberry jam.